Venous Insufficiency Symptoms - What Are They? One of the venous insufficiency symptoms is edema, or swelling of the limbs. 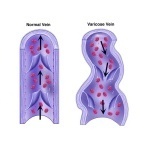 This is common in women who are expecting as varicose veins during pregnancy occur quite often. Skin discoloration is another symptom of insufficient blood flow from the veins. When veins become more prominent with a ropy appearance, this is also a venous insufficiency symptom. Cramping and leg weakness add to the symptoms of symptoms. Legs and feet will sometimes throb or burn. This achiness adds to the symptoms of venous insufficiency. Those at more risk of acquiring venous insufficiency are the elderly, those with varicose veins, obesity, history of deep vein thrombosis or blood clot, those who are inactive or suffer from muscle weakness, and pregnant women. Venous insufficiency causes concern for those diagnosed with this condition as this can be life threatening if not treated. When this condition is caused by blood clots, a doctor will most likely prescribe blood thinners, or anticoagulants. When venous insufficiency symptoms are present, it is advised to wear compression stockings which will enhance blood flow and reduce swelling. Getting more exercise is a must for venous insufficiency as walking will also increase the flow of blood through the limbs. Exercise will also help with weight loss, another necessary plan of action to reverse a venous insufficiency condition.